There are two ways to go about this– and really, it could be a good metaphor for so many endeavors life throws at us. The first method is old school. From the view of the chef, the look of the work space is rustic and cool, BUT it requires effort and patience. You will need a cutting board and a fork. The second requires a food processor and the ability to push a button. Oh technology! How it robs us of the hard work and the beauty both! With either decision you make, own it and embrace it. What really matters here is the result, and you are going to love it. 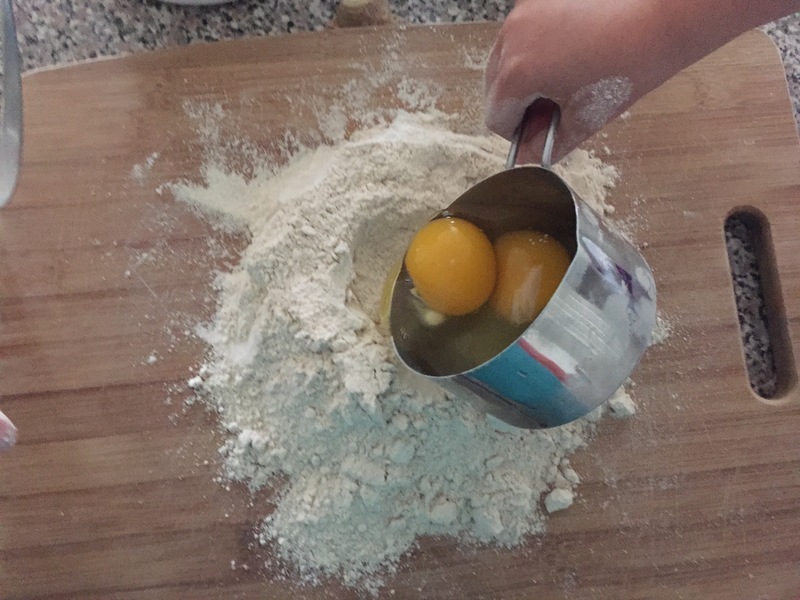 Dump your flour onto your cutting board, make a well in the center, and crack the eggs into the well. Beat the eggs using a quick, tiny, circular motion like you’re making scrambled eggs. Like if they were in a glass bowl, they’d make that taptaptaptaptap on the bottom of it. Be careful not to incorporate too much flour at once just yet. Take some deep breaths. You’re doing great. Keep going. 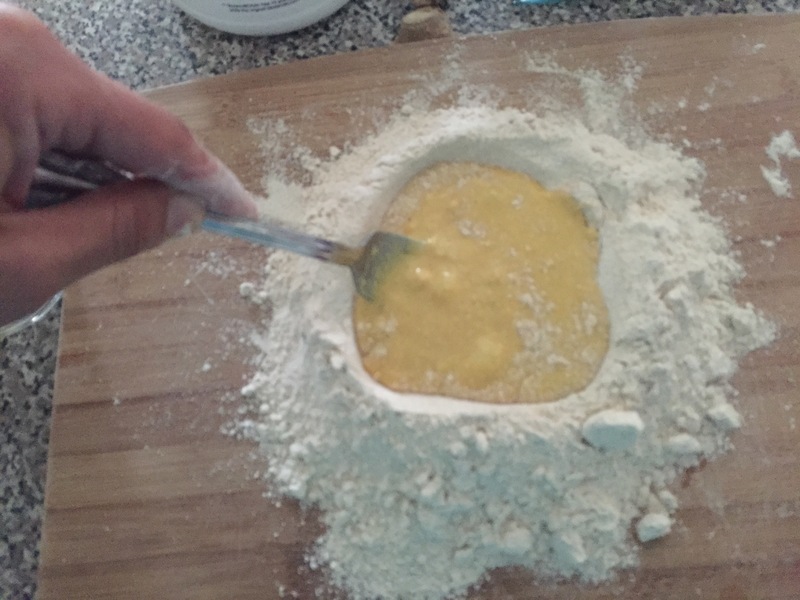 Soon the mixture will be difficult to beat, so start kneading the flour into it. First with the fork: scoop a tablespoon’s worth of flour into the center, squish it down, repeat. Use your hands to continue kneading. Form your dough into a ball. Wrap the dough in parchment paper and let it rest for 20 minutes. Dump the flour into a food processor along with two of the eggs. Let the food processor run for 30 seconds or so until the flour forms into a million tiny yellow balls. Remove the lid of the food processor and add the third egg. Run the food processor again until the mixture clumps up into a dough. Wrap it in parchment paper and let it rest for 20 minutes. 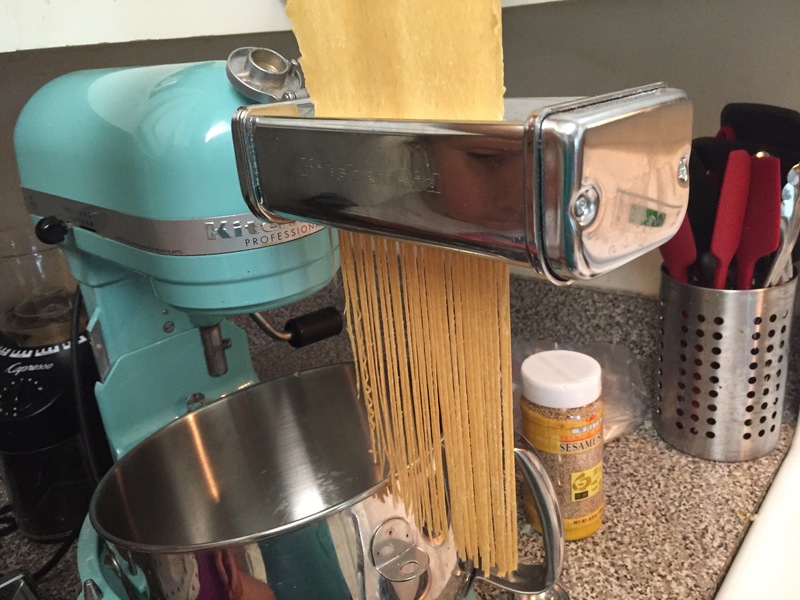 After 20 minutes, play Wiz Khalifa’s “Roll Up” on Spotify or something, cut the dough into 2-3″ chunks and put that pasta roller to work. We have attachments to plug into our stand mixer. One attachment rolls the chunks into strips to our desired thickness, and the other will cut the thinned strips into spaghetti or fettuccine. 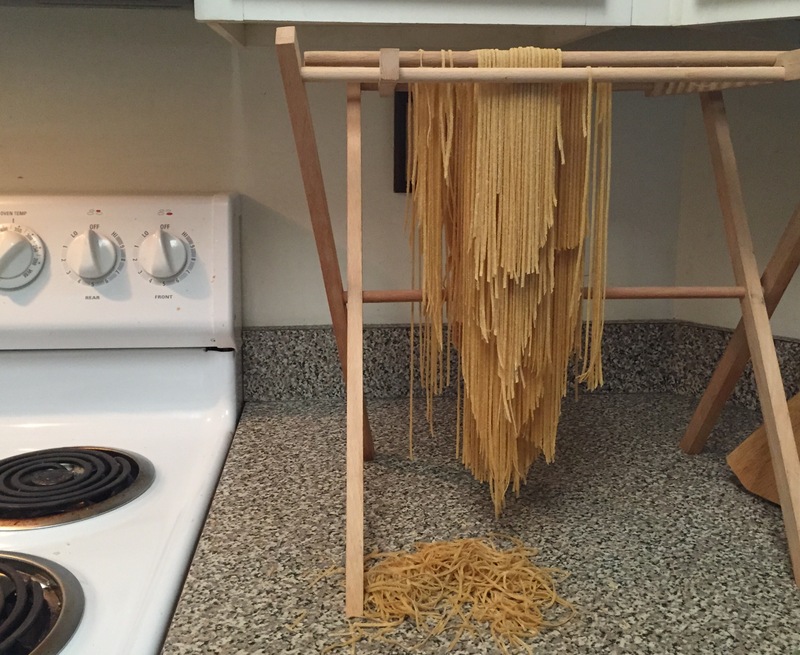 There is no need to wait for the pasta to dry. It can be boiled cooked immediately, and for no longer than 4 minutes.